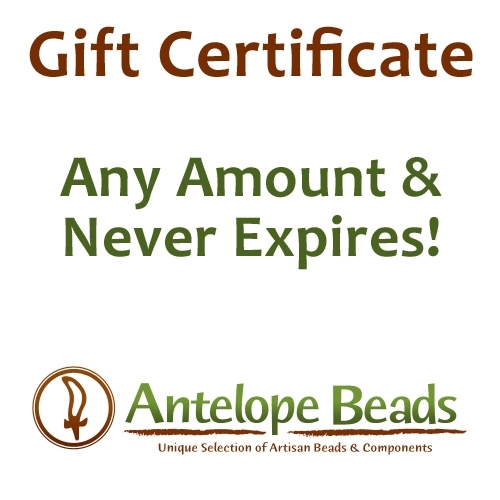 Antelope Beads Gift Certificates can be purchased for any dollar amount and will be sent to recipient via email. Our Gift Certificates never expire! Please add to cart and follow instructions. If you need your gift certificate to be emailed on a certain day, have the gift certificate sent to yourself and then you can forward on the day you would like your recipient to receive it. If you need a printable version please add to the comments box at checkout - PLEASE EMAIL PRINTABLE VERSION. We will email you one to you that you can send. Also, if you don't receive the email, please check your spam or junk mail folder. If you have questions please write us at info@antelopebeads.com or call us at 727-216-8554.